Name : not yet published. Can be found under the name : Pinguicula sp. Sierra Obscura. 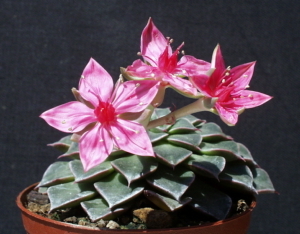 This plant was discovered by the famoust botanist Dr Alfred Lau in Mexico in 1972. It was in the Sierra Obscura, one of the most beautiful landscapes of all the Latin America. Alfred Lau remimbered that arriving there, is practically impossible. Most of all, the weather must be dry. What astonished him, was that most of the plants met, grow suspended, because there is no horizontal ground. He found there a very interested and still undescribed Pinguicula up to now on a permanently wet wall, with a "chalky" ground yellowish together with Tacitus bellus (Graptopetalum bellum). The Sierra Obscura is not far from the town of Nuri (Sonora state) and the western part of the Chihuahua state not far from the town of Moris. 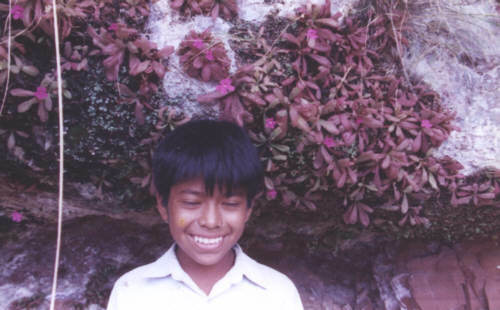 The plants grow overhanging on a permanently wet wall, with a "chalky" ground yellowish together with Tacitus bellus (Graptopetalum bellum). There were no Pinguicula at the bottom of the overhang. Alfred Lau told me that he found this population in a very limited area and no other population around. 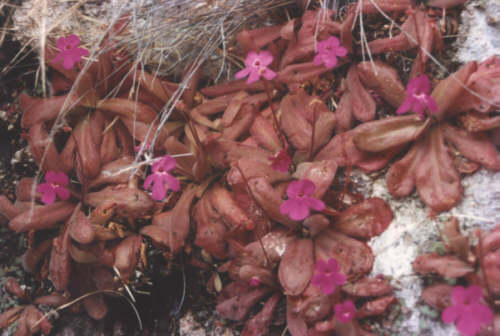 Alfred Lau wrote that he never could cultivate this Pinguicula even in its own substrate. A friend of him in Australia, Mr. Bond, tried it in vitro and he succeeded. Other growers from Japan or UK, tried to cultivate it but finaly lost the plants. You can still find this plant in Australia in a famous carnivorous plant nursery : Triffid park. Who will next try this wonderful Pinguicula and win the challenge ? - one as a temperate Pinguicula like Pinguicula crystallina. Incredible cluster of a non published Pinguicula up to now from Sierra Obscura, discovered by Dr Alfred Lau, growing overhanging a cliff. Incredible cluster of a non published Pinguicula up to now from Sierra Obscura, discovered by Dr Alfred Lau. 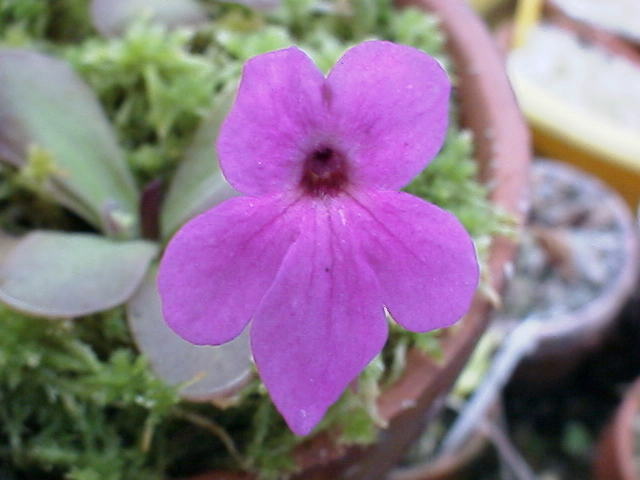 The flower of the Pinguicula from Sierra Obscura.